Thailand tour package with two high-end beach destinations – Phuket and Krabi, along with shopping hub of Bangkok. Ideal package for honeymooners and leisure travelers. Customized holiday package, so easily can be molded as per your choice. Today arrive at Phuket International Airport and meet with Plan Journeys representative. After meet and greet, board your coach to transfer to your hotel at Patong Beach. Check in and relax. Overnight accommodation at your hotel in Phuket. Today after early morning breakfast in your hotel, get ready for the full day tour of Phi Phi Island. Don’t forget to carry your swimwear, sunglasses and camera. Board your van and transfer to the Pier to catch your ferry. You will get chance to do snorkeling and swimming at Monkey beach. Later we will have our lunch at Phi Phi Don, enjoy your free time exploring the surrounding and relaxing on the beach. In the afternoon board your ferry to come back to Phuket. On arrival transfer to your hotel in the evening. Transfer from Phuket to Krabi Hotel by road, the distance is approx. 158 kms by road and takes about 3 hours from one city to another. On arrival at Krabi hotel, check in and relax. Overnight stay in Krabi hotel. Today after morning breakfast, you will be transferred to the pier and from there depart to Chicken Island. Do the sightseeing and enjoy swimming and snorkeling with beautiful fishes and coral reefs. You will also visit Tup Island, Poda Island and Phra Nang Cave during your full day tour. Later arrive at Ao Nang Beach and transfer to your hotel. Overnight stay in Krabi hotel. Breakfast in your hotel in Krabi and transfer to the airport to board your flight to Bangkok. On arrival at Bangkok Airport transfer to your hotel. Check in and relax. 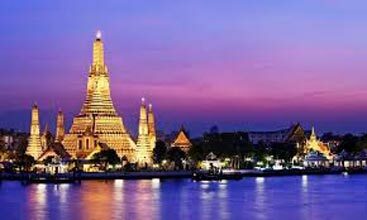 Later in the evening you have time to go for exciting activities in Bangkok like watch Siam Niramit show, Calypso Cabaret Show or go for Chaophraya River cruise for a romantic dinner experience.Overnight stay in Bangkok hotel. 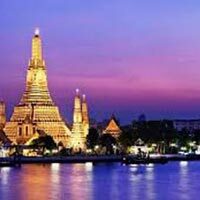 Today after breakfast in your hotel, we will take you to city and temple tour of Bangkok. You will visit the temples of Golden Buddha and reclining Buddha, both these temples are not only the masterpieces and must do places of Bangkok but are visited by thousands of visitors every year. To make it more personal you can opt for a private tuk – tuk city tour. In the evening, go for last minute shopping in Bangkok. Morning breakfast in your hotel in Bangkok, later relax and get ready as per your flight timings, so that we can drop you to the airport to board your flight back to your home. Come back and share your travel experience with Plan Journeys, in order to let us get you better services for your future tour with us.